Today on the way back from Zumba I stopped at Dash Market on Colvin. Hardly had I pulled into the back parking lot when such a sight met my eyes. There was a street sale on that street! I left my car at Dash's and set out on foot down the street. Dash's would not mind. I was going to shop there anyway, when I got back. Among things I bought were 17 back issues of Martha Stewart Living. My friend Melinda would reproach me. "It's all clutter," Melinda says about things like this. And indeed it is. But then Martha Stewart gives you instructions on how to deal with the clutter. Look at the recent September issue. It is: "61 Ways to Organize Your Home and Simplify Your Life." Yeah right, as Leonard used to say. One back issue I got was October 1999. 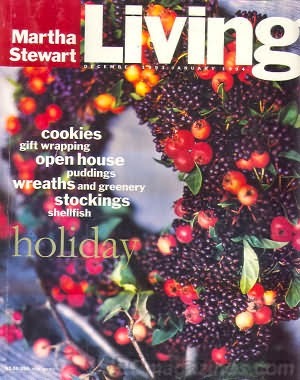 These were the glory days of Martha Stewart Living, when the magazine was fat and brimming with ads for Ralph Lauren and recipes from Mrs. Kostyra and all kinds of yummy and interesting stuff. 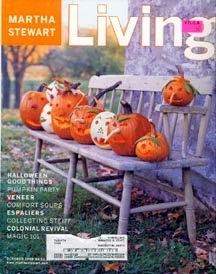 The current October issue, October 2013, is 187 pages. This old one, October 1999, is 300 pages long! It is leisurely as new issues are not. They devote an entire page, p. 197, to a white background and a photo of what looks like a Vermont country road. Unhurried prose. "What a great sense of accomplishment is contained within a brimming bucket of Halloween candy, collected one precious piece at a time while marching steadfastly door to door ...."
There is this recipe I want to try. It is in the back of the December 1994 issue. It is for Brown Bread. You mix 3 1/2 cups whole wheat flour, 1/4 cup all purpose flour, 1 tablespoon cocoa powder (I like that part), 2 teaspoons salt. Then in a small bowl you mix, 1 tablespoon yeast, 2 tablespoons molasses and 2 cups lukewarm water. You mix the wet with the dry until it forms a sticky dough. Form it into a ball, place on a baking sheet, cover lightly with a clean towel (no, a dirty one, you know?) and let it rise for 20-30 minutes until doubled in size. It doubles in size that fast?? I bet mine would not. But let's continue. You then heat the oven to 450 degrees. Bake in the middle of the oven for 10 minutes, then reduce heat to 425 and bake 40 minutes more, or until done. Does that sound too good to be true or what? It must be tried. Brave words from me considering I have not yet even opened my Slimcado. I still have not worked up the nerve!